Disposal of business-related and confidential documents involves highly sensitive material, which requires special attention throughout its life span. This type of documents frequently contains a great deal of classified information that is critical for the operation of the company. Preventing such information from getting into the wrong hands should be a constant undertaking, even in the ultimate stage, i.e. the disposal of documents. 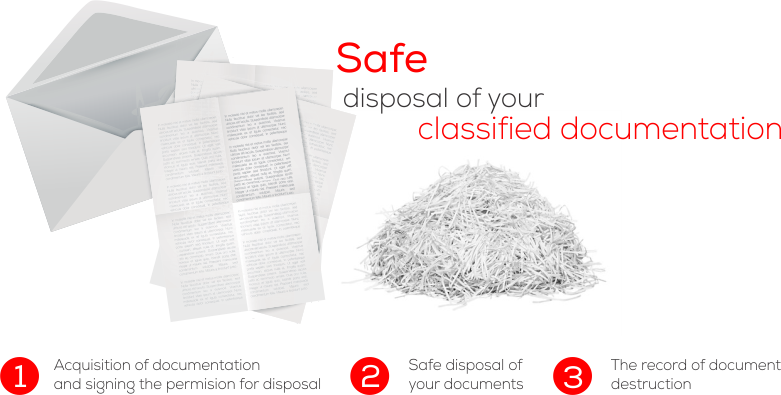 Mikrografija provides the service of professional disposal of documentspursuant with the client’s authorisation for disposal and in line with the requirements of the law, thereby ensuring complete confidentiality and secrecy throughout the entire disposal procedure. The service of document pick-up can be adapted to the client, while the greatest care is devoted to the safety in the process of disposal. Disposal of documents in the presence of a commission can be carried out with or without the client (or their representative) being present; after the completed disposal, the client receives an official record of the procedure. The process of physical disposal is outsourced to our contractual partner who deals in the disposal or various types of documents. as an autonomous procedure in cases where the client has already extracted the relevant documents. Clear out your overflowing archive and allow us handle the pick-up, transportation and disposal of your documents. You can rest assured they will be in safe hands.